And that worked fine. The fat would create fantastic fires! Nowadays there is so much water in chicken that the barbeque almost terminates. And then there is my mother. She prepared food the rest of the year. Working was unfortunately more important so we ate vegetable porridge instead of vegetables. I did not learn to to cook from my parents. But that is the only negative thing thing I can say about them. They are the sweetest persons on th planet with a good brain and sense of humour. But they don’t care about food. I was lucky to live in singapore for a year. I did not have a live besides work but the food was incredible, Every lunch was “Chicken Rice”. Nothing special but everyday a party. The chili sauce is incredible. I searched forever but thanks to Christine’s recipes I can eat this again. Heat oil in wok, sauté minced garlic and grated ginger until aromatic. Add drained rice and stir fry for 3 minutes. Toss in bay leaves and pour chicken stock into the rice. Bring to a boil. Transfer to electric cooker and cook rice as usual. Rinse chicken and drain well. 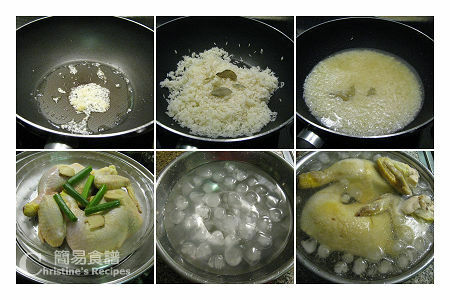 mmediately transfer chicken legs into iced water and soak for 15 to 20 minutes. This is an old traditional Chinese way of making the skin and meat of steamed chicken become smoother and tenderer. When the chicken legs cool down, drain well. Chop into chunks and serve with cooked chicken rice. Garnish with cucumber slices if desired. Many Chinese people like eating steamed chicken with minced ginger and spring onion sauce. Just heat up a bit oil in wok or saucepan. When the oil becomes very hot, immediately pour the oil onto minced ginger and finely chopped shallot. Add salt or soy sauce to taste. That’s the popular ginger and shallot sauce for chicken. 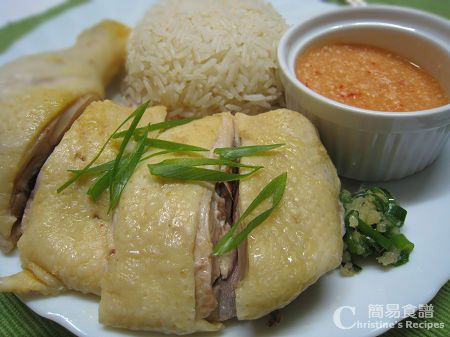 This Hainanese chicken tastes fantastic, accompanying with both chili sauce and minced ginger shallot sauce. You can buy chicken rice everywhere in Singapore and each stall has it’s own recipe and they are all proud of it, Which is completely justified. If you have ever been to Singapore and did not eat this.. You have not been to Singapore. P.S. please vistit the shop van Leven in de Brouwerij.